I thought I was the only person who ever imagined Daniel Cohn-Bendit as being like Courfeyrac. I got that portrait idea when reading the book "1968" by Mark Kurlansky. Majestic_Picnob wrote: Speaking of full names, I've found that Enjolras' first name is nearly always "Alexandre" or "Gabriel." Fitting (a great leader and a powerful angel), but I wonder how this trend came about. I've written a fanfic short story --- an E and E ship that takes place in the present day-- and Enjolras' first name is Gabriel. I thought about giving him the same Henri or Stefan but I've always liked the name Gabriel/Gabe and it does seem fitting for someone like Enjolras. I just can't picture his first name being Edward or Thomas. I've always pictured his name being Gabriel in the book and musical as well. Éponine and Gavroche being associates of Les Amis before the Rebellion. This one doesn't really upset me, I just don't see much canonical precedent for it. In the book, though I may be misremembering a bit, both simply "fraternized with the hurricane" and joined the march from Lamarque's funeral to the barricades along with Mabeuf and the undercover Javert. In the musical Gavroche at least seems to know them (and appears close to Courfeyrac in the movie), but Éponine still joins up at the last minute. We do see her at a rally in the movie though (probably just to ogle Marius). Like I said, doesn't really piss me off, and it's not like Les Amis wouldn't associate with them - they are the "friends of the poor" after all - but it just seems a bit off in a fic to me. Gavroche is known to them in the book - remember, when Navet brings the message to Bossuet, he says he's friends with Gav. And since Gav is known to the guys, the exchange with Enjolras about wanting a musket is much more friendly than if Gav were winding up a stranger. He's possibly better known to the guys than Feuilly, if we take actual statements in dialogue into more account than who gets a paragraph in "A Group That Nearly Became Historic". I've only really noticed it since the movie came out. I'm thinking maybe it's people who've seen the film and seen Éponine and Gavroche at the barricades and consumed enough fandom to know of Les Amis but not read the Brick to know that the members are spelled out there. Particularly as it seems to go hand in hand with forgetting several Amis (Bahorel and Feuilly seem to be the two that so often get missed). On the subject of fanon and Amis, it's strange and vaguely amusing to me, that so much fanart takes its inspiration from the movie, but never with Bossuet. You'll get Killian!Ferre and Fra!Feyrac and Skinner!Joly, and even Brammer!Jehan, but I don't think I've ever seen Stuart Neal inspired fanart once! He isn't bald enough. 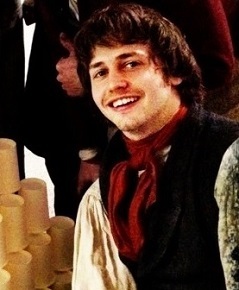 Other than the hair, though, he does look a lot like how I imagine Bossuet; it's the round face. If he has to have the hair, he could be a decent-looking Joly. Fanon seems fond of making him a POC, though, based off of the 25th. It's not a bad thing at all, it's just a really common trend. My philosophy is if you want to count Ep and Gav as "extended Amis," you gotta count Mabeuf, too! Heh, nice. But Mabeuf's not cute or shippable to most people, so he's probably not going to be appear any time soon. The thing with getting Bossuet from the 25thAC though is that no other dominant fanon portrayal comes from there. So it seems more like a retcon excuse for making him the token black guy to me. And people don't seem to mind drawing Marius and Cosette like the movie, regardless of it contradicting their appearances in the Brick. I just feel like Stuart Neal got the short end of the straw He's reasonably cute after all. Acaila wrote: Heh, nice. But Mabeuf's not cute or shippable to most people, so he's probably not going to be appear any time soon. Well, yeah, but he's awesome, and I think he deserves to be part of the Amis family as much as Ep and Gav do. The potential for AUs about the rebellion there...awesome! Yes, I'm stalking old forum posts. I'm guilty.. put me in Saint-Michel! That book is amazing and very helpful. You must read it Its also full of some epic lines. I've read some of the translated bits that have made their way online, I'm just so out of practice with my French, and I doubt I'll get the chance to do more before the show. I was actually talking about the book in regards to the show lately. It was suggested we do a little thing a la the Titanic museum and have names and stories of people from the barricades that audience members are assigned, and of course that book came to mind. I did say there probably wouldn't be enough details, and got told "we could just make them up though". So much shocked and appalled at that bit of sacrilege! They did that in the Boston Tea Party Museum, I got assigned my great (great... who knows how many) grandfather. That was pretty cool. Great idea, really engages the audience. Awww I think the whole letter has translated somewhere? Marianne perhaps? I read it in both English and French.